Cupcake Quilts is at it again. We are making two petite pillows for the month of April. The first fits the 8" square pillow form and the second pillow snuggles nicely in the new Kimberbell 5 1/2" x 9 1/2" rectangular pillow form. 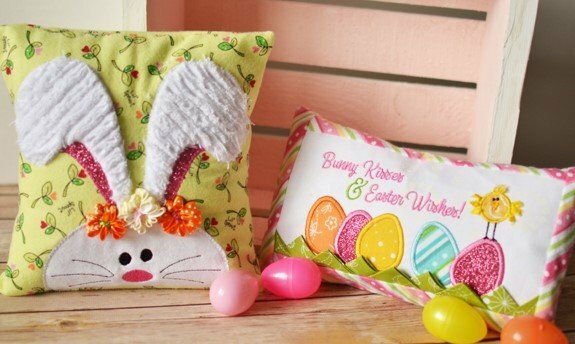 April's projects include a square pillow featuring an adorable bunny with chenille ears and bows. The second is the rectangular pillow with glitter eggs and a fringe-winged chick. This is your chance to learn several embroidery techniques all in one class.